New York: Pathfinder Press, 1968. 22p., third printing of the first edition, staplebound pamphlet, old price label on cover. 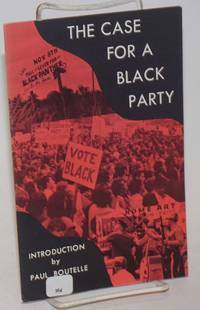 Includes material on the original Black Panther Party in Lowndes County. n.p., [197-]. 17x22 inch poster, very good. 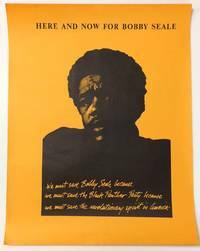 Text below reads: "We must save Bobby Seale because / we must save the Black Panther Party because / we must save the revolutionary spirit in America.". [Germany], 1970. 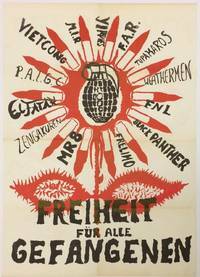 15.5x22 inch poster designed by Holger Meins, translating as "Freedom for all prisoners." The design features a floral motif, with bullets for petals, separated by the names of revolutionary groups from around the world, such as the Black Panthers, Zengakuren, Weather Underground, the Tupamaros, etc. Creased from having been folded, with some toning. n.p., 1969. 19x25.5 inch poster on orange paper; top and bottom edges untrimmed, very good. 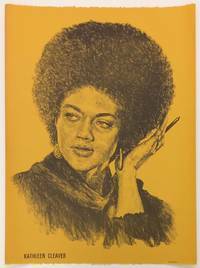 David Mosley produced a number of posters of contemporary Black icons in the late 1960s and 1970s. n.p., [196-]. 17.5x22.5 inch poster with portrait of Newton, very good. Image only; no publication information given. The portrait was taken by Kenneth P. Green Sr. at a 1966 BPP rally in North Richmond, CA. 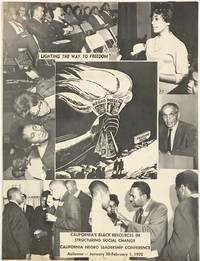 This poster is a surplus duplicate from the papers of Harriet Smith, later known as Sister Makinya Sibeko-Kouate, who was a pivotal activist at Merritt College in the 1960s, serving as student body president and organizing a Black Studies program that brought together several of the founding members of the Black Panther Party in 1966. Berkeley: Berkeley Barb, 1968. Newspaper. 28p., folded tabloid, illus., very light toning, very good. 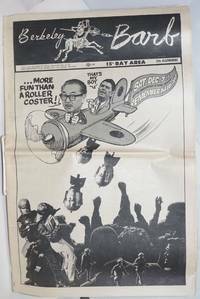 Issue of Berkeley's iconic underground paper with cover cartoon-collage by Harry Driggs depicting S.I. Hayakawa dropping bombs of Tac Squad helmeted heads upon striking SF State students on 27th anniversary of Pearl Harbor. 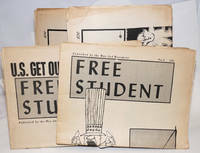 Inside: half-page Nard n' Pat comic by Jay Lynch, much coverage of the SF State strike, news of Panthers Dave Hilliard and Huey Newton by Yippie Stew Albert,. Also other news, columns, and ads of the day. Berkeley: Red Mountain Tribe, 1971. Newspaper. 20p., folded tabloid, illus., very good condition. 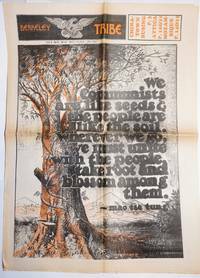 Front and back covers unfold to form a 16.5x23 inch poster featuring a Mao quote: "We communists are like seeds & the people are like the soil. Wherever we go, we must unite with the people, take root and blossom among them." Features: a defense of the Black Panther Party by the ICCF (Intercommunal Committee to Combat Fascism) and a lengthy criticism of the BPP by the Tribe staff. Also excerpt from William Kuntsler speech at an open meeting and fundraiser for the United Prisoners Union (UPU), later nexus for radical prison organizing culminating in the murders of Popeye Jackson and Sally Voye. Much Attica material, and news on FRELIMO and the Portugese colonies in Africa. Plus usual news and ads of the era. Berkeley: Red Mountain Tribe, 1971. Newspaper. 24p., folded tabloid, lightly & evenly toned, illus., very good. Cover headline: "Responding to Laos" with accompanying photo collage of young women waving (non-U.S.) flags. 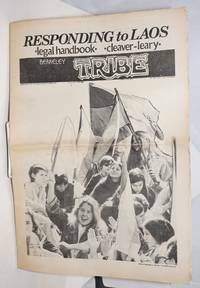 Inside: various articles on the U.S. invasion of Laos and the response (riots) in Berkeley. 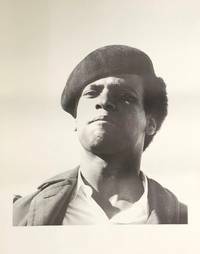 Also: lengthy though edited "open letter" from the Panther 21 to Weatherman arguing for armed struggle and criticizing the BPP, also statement by Huey Newton discussing the BPP expelling the Panther 21 for those criticisms. Full page statement by the Tribe collective regarding the "bust" of Tim Leary by Eldridge Cleaver in Algeria, a four-page centerspread legal guide/handbook for those visited by FBI or police, plus other news and ads of the era. [Pacific Grove, CA]: the Conference, 1970. Four-panel conference program, 8.5x11 inches, very good. The event included Nathan Hare, Angela Davis, Willie Brown, David Hilliard, Jess Unruh, and many others. New York: May 2nd Movement, 1965. Newspaper. Four issues of the tabloid format newspaper, Numbers 4-7. All edgeworn and browned and beginning to split at fold, Number 6 misfolded and unevenly toned with a stain on the upper left corner of the front wrap, else good condition. 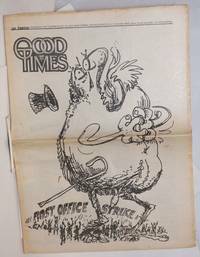 Newspaper of the May 2nd movement, an anti-Vietname student group that was affliated with the Progressive Labor Party and worked closely with SDS. 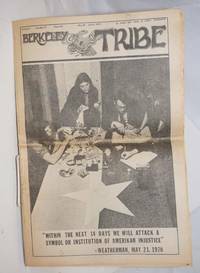 The group disbanded in 1966 and Issue 7 has a statement on their dissolution as well as an article on the original Black Panther Party (Lowndes County). 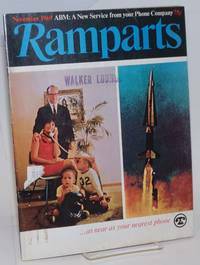 San Francisco: Ramparts Magazine, Inc, 1967. Magazine. 74p., slick magazine format, illustrated throughout, wraps worn and soiled, address label on front wrap, else good condition. Contributions by Noam Chomsky, Paul Goodman, and Studs Terkel, a report on guerillas in Guatemala by Eduardo Galeno, a story on the Black Panthers, and more. 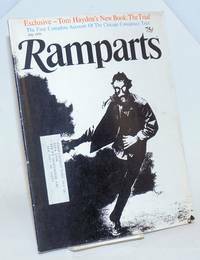 San Francisco: Ramparts Magazine, Inc, 1969. Magazine. The November 1969 issue of the influential magazine. 62p., wraps worn and soiled, ink stamp and residue from address label on front wrap, else good condition. Articles on the 1968 Olympics protests, AT&T's contracts with the US military, part two of a novella by Eldridge Cleaver, and more. 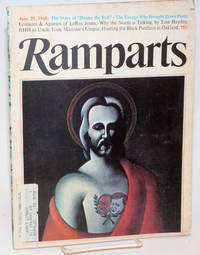 San Francisco: Ramparts Magazine, Inc, 1969. Magazine. 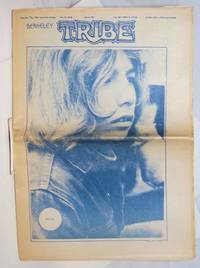 The November 1969 issue of the influential magazine. 62p., wraps worn and soiled, address label on front wrap, else good condition. Articles on the 1968 Olympics protests, AT&T's contracts with the US military, part two of a novella by Eldridge Cleaver, and more. Berkeley, CA: Red Mountain Tribe, 1970. Newspaper. 28 p., folded tabloid, 11.5 x 17 inches, illus., lightly and evenly toned, some light fraying and short closed tear at quarterfold on a few pages, else very good. Cover features photo of young woman with "Sister" button on her sleeve. Inside is 2 page photo spread of women demonstrations, including protest sign calling for pockets in women's clothes.Centerspread on the upcoming Sky River Rock Festival along with a full page cartoon by Bobby London and Ted Richards about caravans heading to the festival. Also material on Huey Newton, piece by John Sinclair, full-page piece by an unnamed Weatherperson confessing their errors, and material on Movement for a Democratic Military. Berkeley, CA: Red Mountain Tribe, 1970. 28 p., folded tabloid, 11.5 x 17 inches, lightly and evenly toned, very good. Cover features large quote from George Jackson (" To the destruction of their enemies, I dedicate my life.") 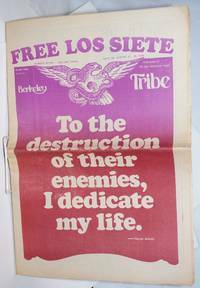 and headline "Free Los Siete." Contents include 2-page spread on funeral of Black Panthers Jonathan Jackson and William Christman, 2-page expose of ex-Weatherman police agent Larry Grothwahl with accompanying poem memoriazlizing Weather's Terry Robbins, poem by Cuban poet Felix Pita Rodriguez, large article on Los Siete de la Raza, various articles rooting for guerrilla struggles in Quebec, Chad, et al. Centerspread is a wallposter "Youth Coalition Comix" with cartoons by Bobby London and Ted Richards, among others. 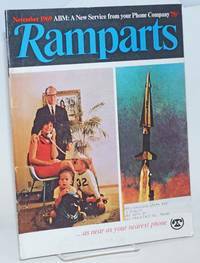 San Francisco: Ramparts Magazine, Inc, 1968. Magazine. 62p., slick magazine format, illustrated throughout, wraps worn and soiled, pencil notation on front page, else good condition with address label of Leon F. Litwick on front wrap. Articles on the May 1968 occupation of the Sorbonne, the Vietnam war, the assisination of Martin Luther King Jr., the Black Panthers, LeRoi Jones [Amiri Baraka], and more. 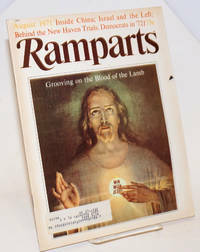 San Francisco: Ramparts Magazine, Inc, 1970. Magazine. 62p., slick magazine format, illustrated throughout, wraps worn and soiled, address label on front wrap, else good condition. Special issue consisting entirely of an extended excerpt from Tom Hayden's book The Trial, on the Chicago conspiracy trial of 1968, plus a brief introduction by the editors. Berkeley, CA: Red Mountain Tribe, 1970. Newspaper. 28 p., folded tabloid, 11.5x17 inches, evenly toned, mild fraying, otherwise very good. Cover is a posed photograph of supposed Weathermen making bombs atop a Vietnamese flag. Contents includes first communique from the Weather Underground with long poem celebrating them, full page ad for "Stew Albert for Sherrif" (sic), excerpts from Marighella's Mini-Manual for the Urban Guerrilla, 3 further pages celebrating the WU and other bombings, etc., full-page dystopian "Children of the Future?" cartoon by Jim Osborne, letter from American prisoners in Mazatlan Prison in Mexico, excerpt from phone call from Eldridge Cleaver in Algeria. 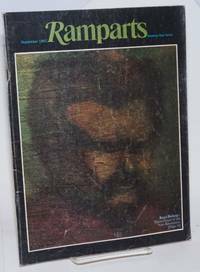 San Francisco: Ramparts Magazine, Inc, 1971. Magazine. The August 1971 issue of the influential magazine. Wraps worn and soiled, small closed tear at edge of front wrap, address sticker on front wrap, else good condition. Articles on China in the wake of the Cultural Revolution, Israel, Bobby Seale and Ericka Huggins, and more.